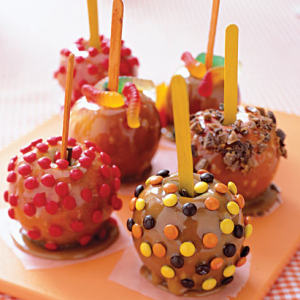 The recipe calls for nuts, but you can grab mini marshmallows, M&Ms, gummy worms or any other spooky treat to make your Caramel Apple delicious! These are perfect for serving at a party or just for sharing with a friend. Yum! What else do you need at a party? Well, a Halloween costume, of course! We’d love to find you the perfect costume and our Halloween stores are exciting and interactive so come take a peak and soak up the fun while it lasts. Remove stems from apples, if desired. Insert wooden stir stick or chopstick into stem end of each. Refrigerate on baking sheet. In 12-cup (3 L) heavy-bottomed saucepan, melt together granulated and brown sugars, butter, condensed milk, corn syrup and salt, stirring. Bring to boil over medium-high heat, stirring and making sure to stir around bottom edge of pot to prevent caramel from scorching. Reduce heat to medium-low; boil, stirring often, for 18 to 20 minutes or until thickened, deep caramel colour and 1 tsp (5 mL) dropped into cold water forms soft pliable ball (234-236°F/112-113°C on candy thermometer). Remove from heat. Stir in vanilla. Let cool for 5 minutes. Line rimmed baking sheet with foil; grease foil and set aside. Place almonds in shallow dish; set nuts aside. Holding apple by stick, swirl all but top of each apple in caramel, allowing excess to drip back into saucepan. Roll bottom half in nuts. Place on prepared baking sheet; refrigerate until caramel is set, about 15 minutes. In heatproof bowl over saucepan of hot (not boiling) water, melt bittersweet chocolate. Remove from heat and let cool slightly. Repeat with milk and white chocolates. Put bittersweet chocolate, milk and white chocolates into 3 parchment- paper cones or resealable plastic bags with corner tip cut off.